Policy: If you are about to make a purchase and discover a lower advertised price by a local retail competitor on the same available brand and model, please let us know. 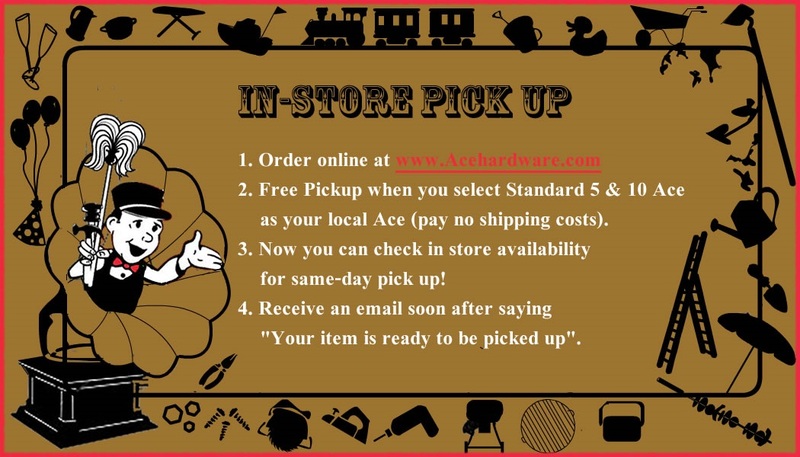 It is our goal at Standard 5&10 Ace, Laurel Ace, and Marin Ace to always do our best to offer our customers competitive pricing. We recognize that from time to time our competition may offer products similar to those we sell. We also recognize that despite our efforts to offer competitive pricing, it is possible that our pricing does not meet our stated goal or your expectations. In this day of the big box and their “low price guarantees” it is our policy to make every effort to match any competitor’s price on an identical in stock item. Please understand that despite our best efforts, we may NOT be capable of matching a competitor’s price. In the rare event that we are unable to match a specific price, we hope you will also consider our helpful friendly service and ongoing community support efforts as part of your purchasing decision. We truly value our customers, and will respect your purchasing decision either way. The Store Price Matching Policy does not apply to our or our competitors’ free offers, limited-quantity items, items for sale in after Thanksgiving promotions, (i.e. Black Friday), open-box items, clearance items, Outlet Center items, mail-in offers, financing, bundle offers or pricing errors. The Store Price Matching Policy is only for brick & mortar stores, not online stores. VIA FACEBOOK: “Like” LaurelAceHw on Facebook, and/or friend Stan Standard for updates and news from all our stores. 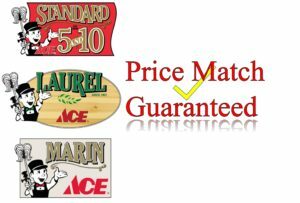 VIA TWITTER: Laurel Ace Hardware Follow our tweets to keep up with sales, coupons and specials. VIA EMAIL/TELEPHONE/SNAIL MAIL: Call 415 751 5767 or email our Marketing Department to be added to our snail mail or email newsletter list.